Marc Marquez won back to back MotoGP world titles and he will go into the 2015 season as hot favourite to complete the hattrick. The pre season dates for winter testing has been confirmed which will take place in Asia, Middle East and of course in europe. 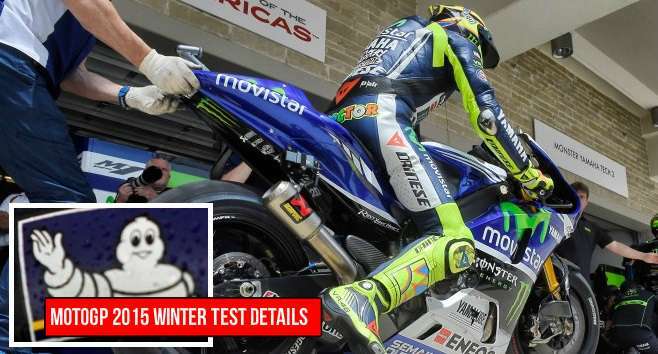 The venues are the usual ones which has been hosting winter testing in last couple of years, the first two winter tests will take place in Sepang, Malaysia and than motogp teams will move to Losail circuit in qatar for the final tests. Moto2 and Moto3 categories winter testing will be taking place in spanish location, first in valencia and than in Jerez. here is the complete schedule of all three category winter test. Every MotoGP test will last 4 days out of which one day will be reserved as Michelin testing. Michelin testing will be the last day on both Sepang tests while it will be the first day on losail circuit testing. Michelin tyres will be used in 2016 grand prix and these test will let the company to assess before they replace Bridgston next year. Moto2 and Moto3 test will take place in spain as usual and all the three test in Moto2 & 3 category will last three days. The first race of the season will be on 29th march 2015 in Qatar and you can get the Full MotoGP 2015 calendar here.